A roubust perennial herb with thick, long roots, 1-15m tall and grows on rocky lands roots are stout and the stem is hollow. Lower leaves are 20-50cm in diameter, orbicular and are broadly ovate. Flowers are small and dark purple in color. Fruits are purple and angled. Rhubarb is used as purgative and astringent tonic. Its stimulating effect, combined with aspirin properties, renders it especially useful in atonic dyspepsia. 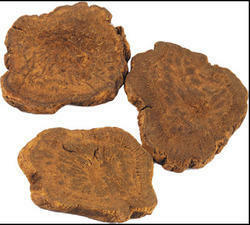 Rheum emodi, commonly known as Himalayan rhubarb, is a medicinal herb used in the Indian Ayurvedic system of medicine. It belongs to the family Polygonaceae. The plant is found in the sub-alpine and alpine Himalayas at an altitude of 4000 meters. Sanskrit - Amlaparni, Revatchini; Bengali - Rheuchini, Banglarevanchini; Gujarati - Gamnirevanchini; Hindi - Revand chini. 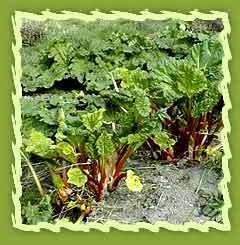 Rhubarb is a perennial plant that grows from thick short rhizomes. The large, somewhat triangular leaf blades are elevated on long, fleshy petioles. The flowers are small, greenish-white, and borne in large compound leafy inflorescences. Rhubarb is grown primarily for its fleshy petioles, commonly known as rhubarb sticks.